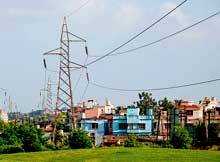 The Odisha government has decided to provide electricity to all villages of the State by 2019, said Energy minister Pranab Prakash Das on Monday. Chairing an annual review meeting of the Energy department, Chief Minister Naveen Patnaik directed the department to improve and strengthen power production, distribution and transmission in the state in order to achieve the above target. The government has ensured electricity supply to 43753 villages so far, out of 47677 villages in the state. Similarly, it has provided electricity to 54061 hamlets, out of 82014, said an energy department official. The state government said it has provided electricity connectivity to 92 percent villages and 66 percent hamlets. While the state had 16 lakh consumers in the year 2000, the number increased to 58 lakh in 2015. It is targeted to increase the number of connections to 96 lakh by 2019. Besides, in the last five years, 25 lakh BPL families have been provided with electricity connections under different schemes. Besides, 24-hour electricity supply to rest of the State remains a challenge for the government. The Energy minister said there is no significant increase in power production. Though the State has signed MoUs with 29 companies, only three of them have reached the stage to produce power. The department has kept a target to set up 10 sub-stations of 33/11-KV in every month from August onwards. Total 500 such sub-stations will be established, the minister added. In the review meeting, the officials of the department were asked to take steps so that distribution losses could be lowered from 38% to 26% by 2019. However, Opposition leader Narasingha Mishra slammed the State government over frequent power outages and tariff hike. “Though the officials said there will not be any power cuts, the villagers, who are experiencing 12-16 hours of power outages every day, can speak about the actual scene,” he said.